Two batters later, shortstop Kyle Wilson added to the lead with a solo home run. Second baseman Garrett Giovannelli joined the home run part with a two-out solo shot to the deepest part of center field and the Govs held an 8-4 lead. UT Martin (19-22, 8-12 OVC) began its game-winning rally innocently enough with the first three batters reaching base safely to load the bases with no outs and force a Govs pitching change. Designated hitter Dan Kerwin followed the pitching change and railed a 2-2 pitch over the wall in left center for a game-tying grand slam. The Skyhawks weren’t done as right fielder Tanner Wessling singled and first baseman Ryan Helgren reached on a fielder’s choice that wiped Wessling off the base paths. Center fielder Creighton Eldridge wasted no time ending the game, hitting the first pitch he saw for a walkoff two-run home run. The late outburst made a winner of UT Martin reliever Alex Evans (6-4), who allowed four runs on five hits in three innings. Skyhawks starter Dalton Westfall was left out of the decision after allowing four runs (three earned) on three hits while walking four and hitting another four batters. Kerwin ended the game with a 3-for-5, six RBI outing that included a pair of home runs. He hit a two-run shot in the third inning that got the Skyhawks their first runs of the contest. Giovannelli had the Govs only multi-hit outing, ending the opner with a 2-for-4 effort that saw him score twice and finish with a RBI on his solo home run. Govs reliever Levi Primasing (1-1) was tagged for the loss after allowing three runs on three hits while recording one out. Austin Peay starter Jacques Pucheu also was left out of the decision after going just four innings, allowing two run on two hits and four walks. Second baseman Garrett Giovannelli extended his hit streak to 12 games with a fifth-inning single. But his eighth-inning home run to the deepest part of Skyhawk Field was his second in the Govs last three games. Shortstop Kyle Wilson ended a long home run drought with his eighth inning home run. It was his first round-tripper since Feb. 22 against Southern Illinois in the season’s fourth game. It also was his third consecutive game with a base hit. 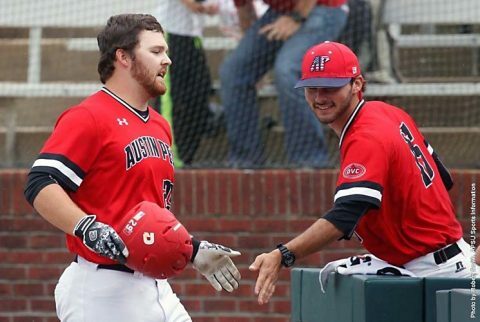 Austin Peay hit a home run for the 10th time in its last 11 games. It also was their second three-home run outing in that span. Centerfielder Imani Willis was hit by a pitch in each of his first three plate appearances, scoring twice. He tied an Austin Peay single-game record for times hit by a pitch, matching Trey Lucas (2008), Brett Luther (2006) and Shawn Kelley (2004).